Did you know that in a given year across the United States, that more tow truck drivers are killed on the job than are police officers? Surprising, isn’t it? But it’s true. This is why our industry has lobbied hard to have tow trucks added to each state’s “Slow Down, Move Over” laws. We’ve been very successful. With the addition of Hawaii in 2012, we now have this important law on the books in all 50 United States. 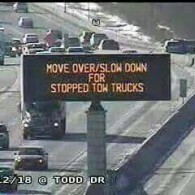 Now the industry, with the help of many State agencies, is working to increase public awareness of this law and what we need to public to do to stop killing tow truck drivers on the side of our highways. This excellent video produced by United Coalition for Motor Club Safety is highly educational, if a bit emotional. Towers and the motoring public alike need to watch this, and share it. Please – my life depends on public awareness of our need for a safe space to work.